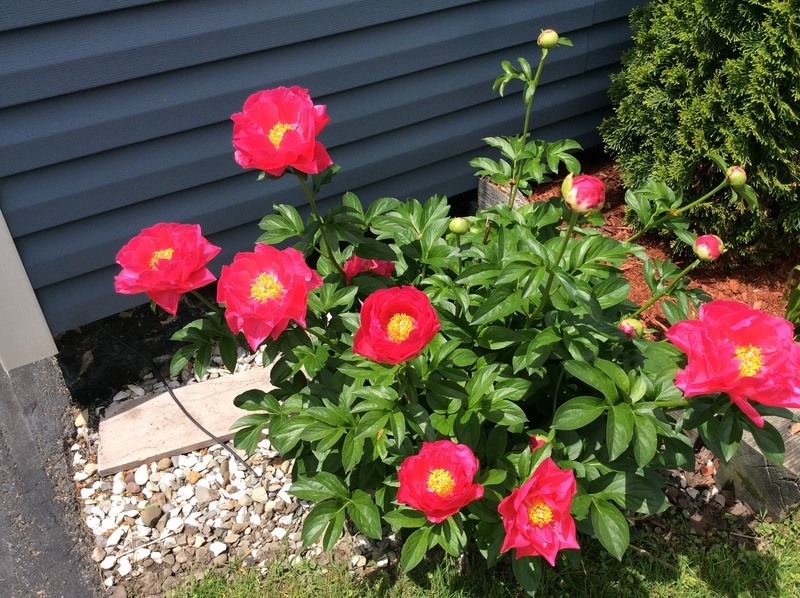 A quick front-yard update in our home in the Syracuse city neighborhood of Eastwood finds the peony plant proudly pushing out even more blossoms on a cool day. Two new daisies in the ground. My dear wife Karen has planted two more Gerbera daisies in the hourglass-shaped garden, after Good Neighbor Tim and his wonderful wife Lorraine picked up a deep pink plant and yellow plant for us on a holiday nursery run. Weeds be gone under this big bush. 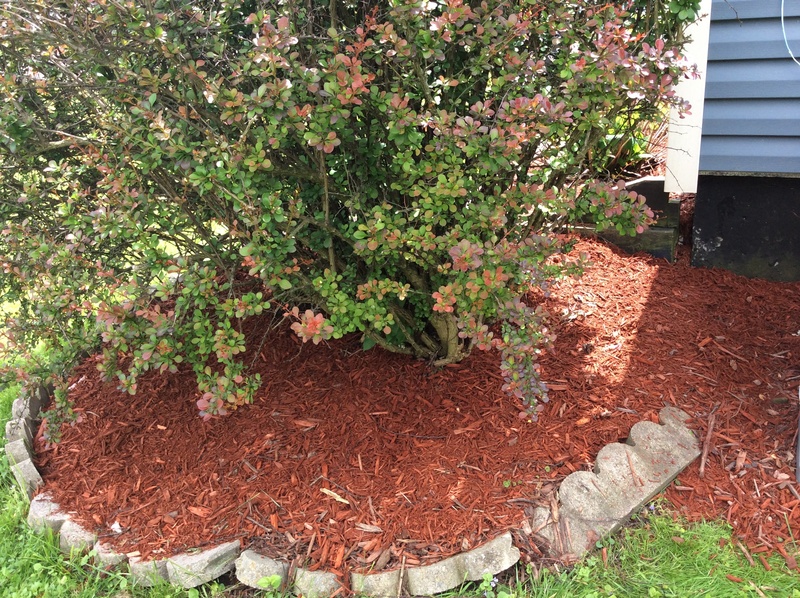 I’ve spread two bags of mulch-plus-Preen under the big prickly bush that’s always been prone to weeds. And the clippings still await pickup by the city crew. And out front, our collection of grass clippings, weed pullings, dead branches and pine cones has grown. The city pickup of garden recycleables, due the first week of May, still hasn’t come by. Good Neighbor Tim told me he called and was told this week. Goodie. That’s one week ahead of the scheduled pickup for June. 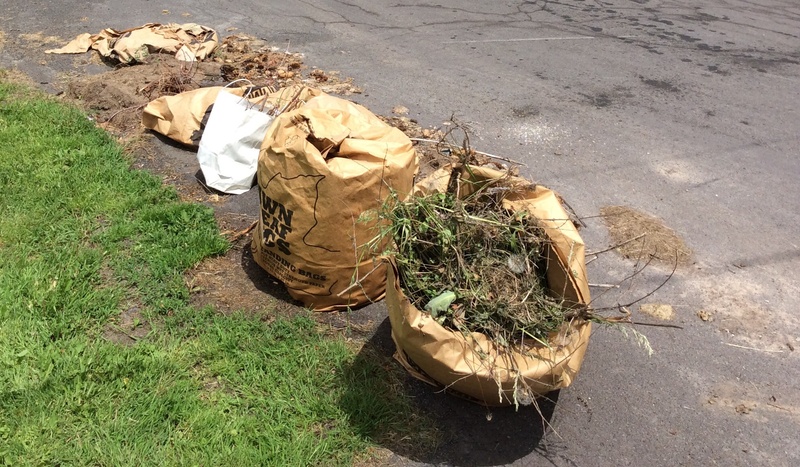 Do you put grass clippings and other natural recycling items out for pickup? How often is your natural recycling picked up? Do you just mow your lawn without a grass bag and pile branches and leaves to go to nature on your own property? Have you ever started your own compost pile? Karen and I prefer the kept look in the yard for the flowers and such. To each, as they say, ESN. The Town of Geddes, if it still is the same way, was very consistent about it. It was a weekly basis they would come by and pick up recyclable clippings. Town of Onondaga is alright. I do not like the fact that these clippings have been kicking around Eastwood for three weeks now, every street. I know, right? Wake up, City. Now that’s an image to set composting back an eon or two, Kerbey. No wonder I don’t compost. Here, they take all the clipping and compost them in one central location. I always wanted to start a compost, but would not be able to handle all that stuff in it. We’ve never tried. Maybe someday, Dora, but like you say, you have to be ready for what goes in and comes out. it’s looking gorgeous. We have a huge brown wheelie bin for our garden waste picked up on Fridays – amazing! All part of the recycling effort by our local council. We make our own compost too but only because we can hide the compost bin away at the bottom of the garden. I like the every week pickup, Rachel. The once a month is good … but not when they are three weeks late. We have never tried composting. Maybe someday. Three weeks late is not good. We had a problem like that for months – they would just miss our road (and this was our normal rubbish collection) – a neighbour threatened to tell all the local papers and they’ve collected on time ever since. We always just called them Gerber daises and then found out it was Gerbera. Oh, well, Robin! Your garden looks beautiful Mark and Karen! Thank you, Diana. It’s really shaping up this year. We’ve just started collecting the branches and breaking them up to use in our chiminea. We don’t have much yard waste. On occasion last year I had to rake but so far not this year. Your garden is looking so welcoming and pleasant! When we first moved in the claw came round weekly. We would stack up our green waste in the street and the claw drove by and scooped it all away. The city switched over to green waste cans that we wheel out every other week. We have a small compost pile that I’m piloting this year. The plants are loving it! I’m into it so far. Hope you’re well Mark! The claw! Beware the claw. I love it, Sandra. Only the claw knows what you put at your curb. Ah, well, now it’s just a green can. Too bad. And yes, we are well, Sandra. Hope you and Erik are too as we get ready for a weekend. Yes, it’s a no-no to mix the trashes here, too. Thanks, the garden is have a very good year, knock on wood, Rachel! Indiana, PA has a drop off site with a massive composting operation–grass and leaves, brush and branches up to 6″, and Christmas Trees each January. 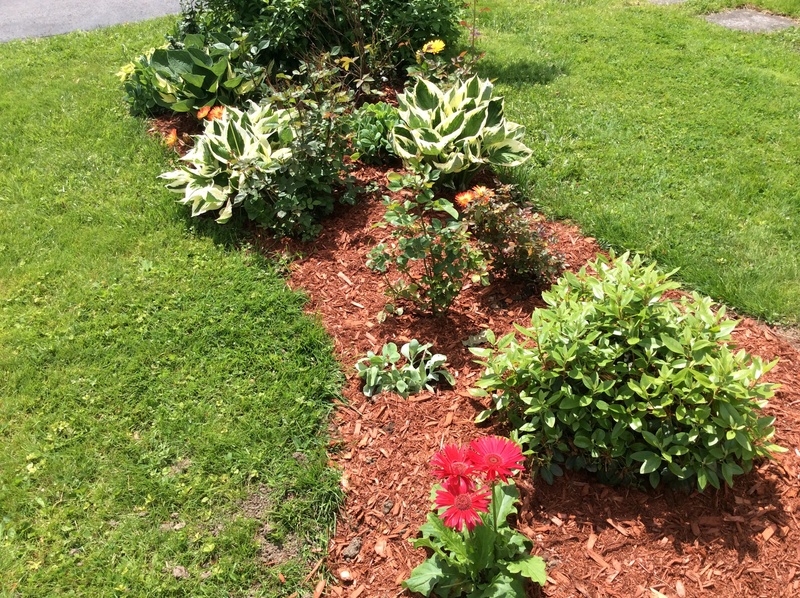 Wood chips and mulch are free for all–but I won’t use the compost because the all the lawn services drop off there and that stuff if full of Scott’s, ChemLawn, and the like. We compost at home, collecting clippings only to add some heat to the piles, or if we’ve let it go long enough that the mower makes windrows–otherwise we let the clippings lie. Good system, Chuck. Our city free compost piles stink to high heaven. I can’t go near them. That looks like some good stuff for a compose box. I guess it would be hard to keep on up there with all the wild animals. But the garden looks lovely. Too much stuff for our little yard for a compost box, I think. But our garden is doing well, Kim. Thanks.